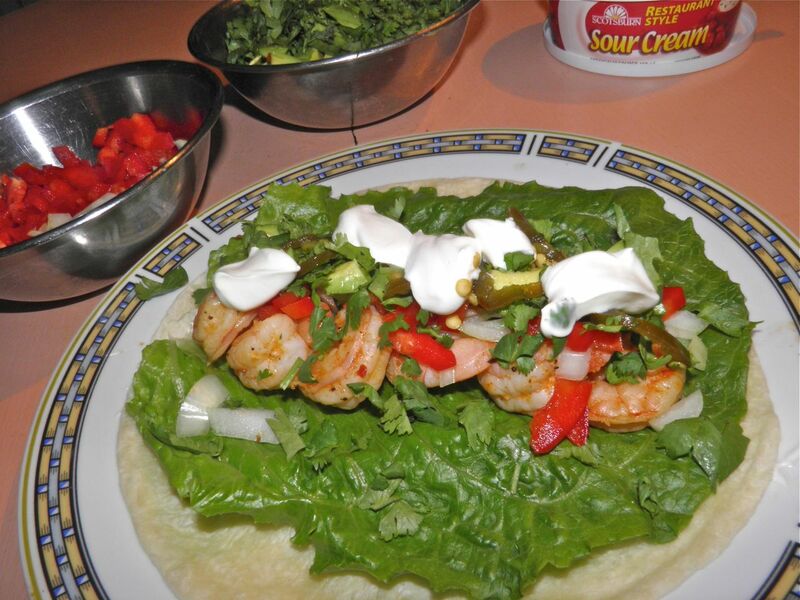 Tasty shrimp fajitas. The most cooking is spent chopping the veggies. A few days ago I posted a spice rub for “chicken, beef and pork” that could be used for either grilling or broiling. You can find the recipe HERE. Well I seemed to have left off something from the list – namely seafood. I didn’t know for sure if it would work on seafood because of its delicate taste. If used correctly it’s just wonderful. Shrimp seem to be able to handle more spice than, say, sole fillets. I wouldn’t rule out using this spice on any fish. Just take care in how much you decide to use so it doesn’t overpower the flavour of the fish. I was craving something with Central American accents but I had never had a shrimp fajita before. What I did have was a few bags of shrimp in my freezer from the last time they were on sale at a local grocery. So it was time to break one out and thaw it. If using previously frozen shrimp you should really let them thaw naturally. That way all the natural juices tend to stay in the shrimp. Regardless, always drain them. 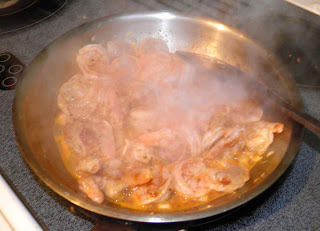 Adding undrained shrimp introduces additional liquid that then has to be boiled off, depending ion your use, and will result in overcooked shrimp. For these fajitas I re-imagined a recipe that I usually do for beef fajitas (HERE). 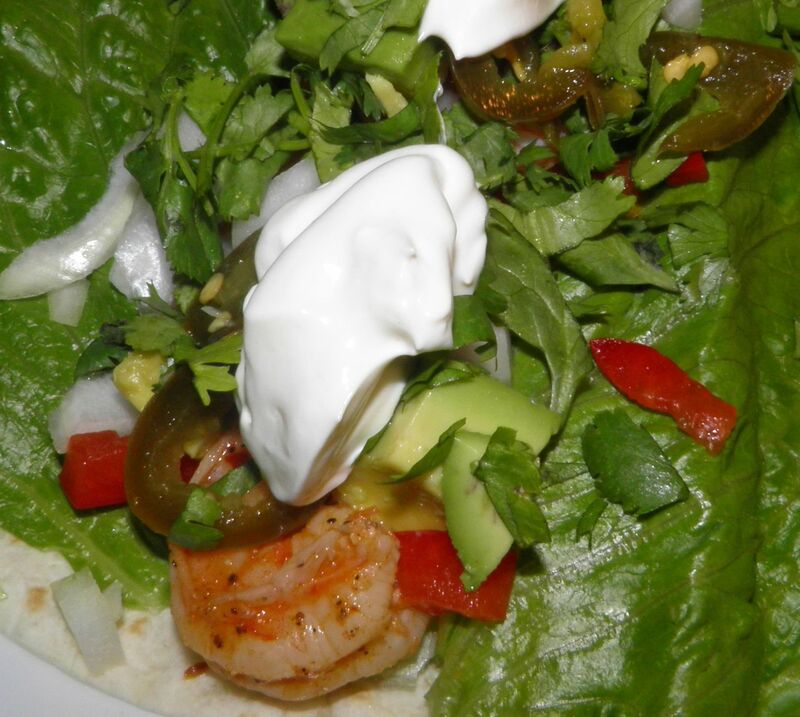 With a few tweaks it was quite easy to turn these into delicious shrimp fajitas. I was very pleased with the taste. I’ll certainly be making them again. Chop the onion and red pepper and set aside in small bowls. Peel and chop the avocado and place in another bowl. Chop the cilantro and place in a bowl. Heat the oil in a skillet and sauté the garlic until fragrant, about 1 minute. Add the shrimp and sprinkle with the rib rub. 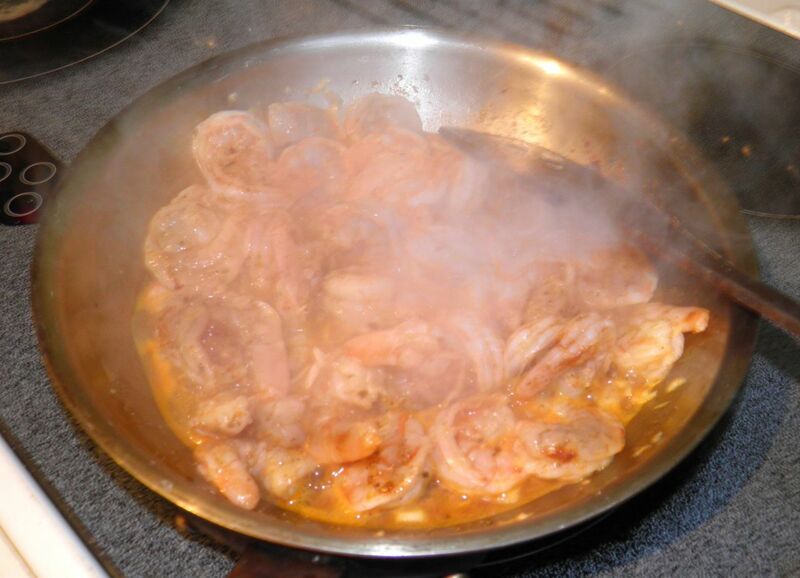 Sauté the shrimp until just cooked through and pink, about 4-5 minutes in total. Assemble by placing a leaf of romaine on a warm tortilla. Top with 5-6 shrimp lined up in a row, then some onion, red pepper, avocado, cilantro, sour cream and jalapeno slices if using. Roll up and serve!